We talk about tachycardia when, at rest, apart from physical exercise, the heart beats too quickly, at more than 100 beats per minute. A heart normally beats when it is between 60 and 90 beats per minute. In case of tachycardia, the heart beats rapidly, and sometimes irregularly. This acceleration of the heartbeat may be permanent or transient. It can in some cases not lead to any sign. In other cases, it may cause dizziness, lightheadedness, palpitations, or loss of consciousness. Tachycardia can range from a mild disorder to a very serious disorder that can lead to cardiac arrest. How does the heart rate vary? The heart rate varies according to the oxygen needs of the body. The more oxygen the body needs, the faster the heart beats, to further circulate the red blood cells, our oxygen carriers. Thus, during a physical exercise, our muscles needing more oxygen, the heart accelerates. The acceleration of the heart rate is not the only adaptation of our heart, it can also beat stronger, that is to say contract more powerful. The rhythm of the heartbeat is also determined by the very functioning of the heart. It can, in some heart diseases, exist misfires in the way of the heart to determine its rhythm. – Sinus tachycardia: it is not due to a heart problem but to an adaptation of the heart to a particular circumstance. It is called sinus because the general rhythm of the heartbeat is determined by a specific location of this organ called the sinus node (area normally source of regular electrical pulses and adapted resulting in cardiac contractions). This sinus acceleration of the heart may be normal, as when it is related to physical exertion, lack of oxygen at altitude, stress, pregnancy (the heart is accelerating naturally at this time of life) or taking an exciting like coffee. In the case of physical exercise for example, the heart accelerates to bring more oxygen to the muscles that work. It is therefore an adaptation. In the case of altitude, oxygen is rarer; the heart is accelerating to provide enough oxygen to the body despite its scarcity in the air. But this sinus acceleration of the heart can be linked to an abnormal situation in which the heart adapts by accelerating its rhythm. This occurs for example in case of fever, dehydration, intake of toxic substance (alcohol, cannabis, certain drugs or drugs), anemia or hyperthyroidism. In the case of dehydration for example, the volume of liquid in the vessels being decreased, the heart accelerates to compensate. In the case of anemia, the lack of red blood cells causing a lack of oxygenation, the heart accelerates its pace to try to bring enough oxygen to all organs of the body. In the case of sinus tachycardia, quite often, the person does not realize that his heart is beating fast. This tachycardia can be discovered by the doctor. Sinus tachycardia can also be related to a tired heart. If the heart fails to contract effectively enough, the sinus node requires it to contract more often to provide enough oxygen throughout the body. People with this STOP have difficulty going from lying posture to vertical posture. During this change of position, the heart accelerates excessively. This increase in heart rate is often accompanied by a headache, feeling sick, tired, nauseated, sweating, discomfort in the chest and sometimes even fainting. This problem may be related to certain diseases, such as diabetes, or taking certain medications. It is treated with a good intake of water and mineral salts, a program of physical training of the legs to improve the return of venous blood to the heart, and possibly medications such as corticosteroids, beta-blockers or other treatments. – Tachycardia related to a heart problem: it is fortunately rarer than sinus tachycardia. The heart having an abnormality, it accelerates while the body does not need a beating heart faster. – Tachycardia related to Bouveret’s disease: it is relatively frequent (more than one in 450 people) and most often relatively benign. This is an anomaly in the electrical system of the heart. This anomaly leads at times to sudden tachycardia attacks for a while before ceasing just as abruptly. The heart can then beat at over 200 per minute. This is embarrassing and often leads to discomfort to lie down for a while. Despite this anomaly, the hearts of these people are not sick and this problem does not diminish life expectancy. Wolf-Parkinson White syndrome is another type of tachycardia that also corresponds to an abnormality of the heart’s electrical system. It is called supraventricular paroxysmal tachycardia. Ventricular tachycardias: these are accelerated contractions of the ventricles of the heart related to heart disease (various diseases). Ventricles are pumps used to send oxygen-rich blood throughout the body (left ventricle) or oxygen-poor blood to the lungs (right ventricle). The problem is that when the ventricles begin to beat much too quickly, the cavity of the ventricle does not have time to fill with blood. The ventricle no longer acts as an effective pump. There is then a risk of stopping the effectiveness of the heart therefore a fatal risk. Ventricular tachycardia is therefore a cardiological emergency. Some cases are relatively mild and others extremely serious. In the most severe cases, ventricular tachycardia may progress to ventricular fibrillation corresponding to desynchronized contractions of muscle fibers. Instead of contracting all at the same time at the level of the ventricles, the muscle fibers contract each a little at any time. The cardiac contraction then becomes ineffective for ejecting the blood, and this has the same effect as a cardiac arrest. Hence the gravity. Using a defibrillator can save the person. Atrial or atrial tachycardia: this is an acceleration of the contraction of part of the heart: the atria. The latter are small cavities, smaller than the ventricles, whose role is to eject the blood to the left ventricle for the left atrium and to the right ventricle for the right atrium. In general, the rate of these tachycardia’s is high (240 to 350), but the ventricles beat more slowly, often one time out of two compared to the atria, which remains very fast. The person may not be embarrassed in some cases, or receive it in other cases. How is a tachycardia diagnosed? The diagnosis of tachycardia can be made from the symptoms presented by the person consulting or discovered by a doctor on examination or electrocardiogram. It can also be an extreme emergency where the person loses consciousness. After a clinical examination, the doctor carries out or prescribes different examinations. First an electrocardiogram (ECG), its layout reflecting the electrical activity of the heart. Thanks to sensors placed on different parts of the body (chest, wrist, ankles, etc. ), the doctor can visualize the electrical signals of this organ and detect anomalies. A portable device, the Holter, allows to follow the cardiac function over 24 hours, continuously. Thus, tachycardia occurring only under certain conditions can be detected. Other tests, such as an echocardiogram of the heart (echocardiogram) can visualize the blood flow and detect some clots. A stress test (ECG performed during a stress test such as cycling), can also be prescribed to better understand the type of tachycardia incriminated. 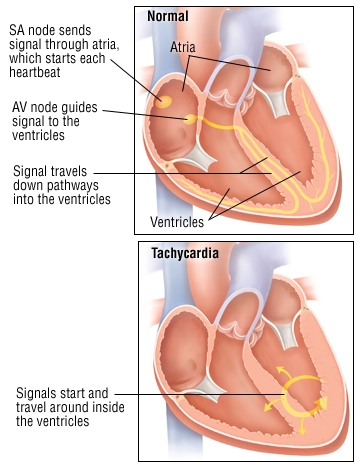 The complications of tachycardias vary depending on the type of tachycardia and the presence or absence of heart disease. When tachycardia is an adaptation to a health problem, its positive evolution or not depends on the treatment of this disease. When tachycardia is due to heart disease, the evolution depends on this heart disease. The most serious complication is the risk of death in case of severe and severe ventricular tachycardia. Discomfort or loss of consciousness is a sign of gravity. When the heart does not contract in a normal way, the blood flow is not fluid and a clot can form, sometimes leading to serious complications: stroke or myocardial infarction. Tachycardia may be associated with heart failure . – more rarely to an infraction. Who are the people at risk for tachycardia? The age increases the risk of tachycardia. Because the heart is aging, it becomes more fragile and more likely to work less well. People who have parents with tachycardia have a higher risk of developing this disease. 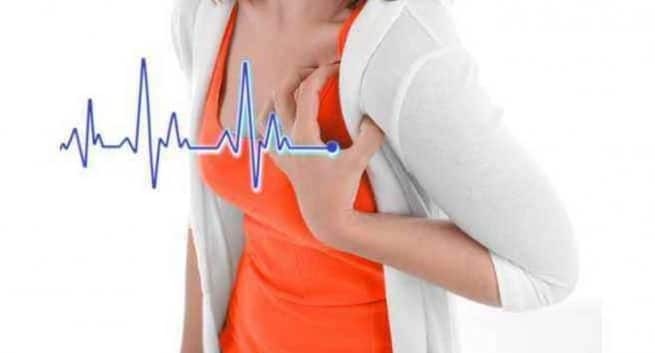 People with heart disease (heart muscle, heart valves), congenital heart disease, angina pectoris, or heart attack are also at higher risk for episodes of tachycardia. It is possible to prevent certain tachycardias by adopting hygiene measures that influence the factors of cardiovascular diseases. This reduces the risk of angina pectoris and infarction that can cause heart rhythm disturbances. Thus, it is useful not to smoke, to drink reasonably, to eat balanced, to maintain a suitable weight, to manage stress better, to exercise, and therefore to adopt a healthy lifestyle in everyday life . This allows, among other things, to control his blood pressure and his cholesterol level, two parameters that influence the condition of the arteries. It is also important to avoid toxic products, drugs or alcohol that can affect the functioning of the heart. Sinus tachycardia. It is most often treated well, by treating the problem at the origin of this acceleration of the heart rate. For example, treating hyperthyroidism heals the associated tachycardia. Heal anemia too. In some cases, the cardiologist may prescribe a treatment to slow the heart while waiting to cure the disease. treatmentventricular tachycardia is also established with, for example, an antiarrhythmic drug, a beta blocker, and sometimes ablation of the area that causes ventricular tachycardia attacks (by surgery or radiofrequency to treat the dysfunctional area). ). Finally, the establishment of an implantable defibrillator that triggers and produces an electric shock in case of onset of ventricular tachycardia may be proposed. And then, when possible, the basic treatment of the heart problem causing ventricular tachycardias is of course to put in place. Atrial tachycardia. In case of arrhythmia in the atria, anticoagulation is introduced, so as to avoid clots forming at this point. They would be dangerous because they would be sent into the ventricles, then into the arteries they could clog. Atrial tachycardia can be treated with medication, which is effective in about two thirds of cases. In other cases, the medical specialist may prescribe a treatment, the electrical reduction, of sending an electric current so as to restart contractions at normal rhythm in the atria. The preventive treatment of relapses of atrial tachycardia is put in place by antiarrhythmic drugs. But it can also consist of radiofrequency treatment depending on the case.